Lieutenant Governor Sheila Oliver joined JFS staff at Project Homeless Connect on January 23 in Atlantic City. The annual event provides necessities to the homeless population while connecting them with area housing, medical and social services. Research shows that greater social connection is associated with a significant increase in life expectancy. Inspired by creative approaches abroad, communities across the United States are taking steps to reduce social isolation and increase residents’ sense of belonging. To address social engagement, Robert Wood Johnson Foundation (RWJF) provided $2.5 million in funding to bring successful overseas programs to the US. Holocaust survivors celebrated Tu B’Shevat with the children of Shirat Hayam on January 16. During the luncheon, the group participated in art projects and festive songs. Utilizing the Connecting People model from the United Kingdom, JFS will work with incarcerated — or recently released - individuals affected by mental illness to form new relationships—and maintain existing relationships with friends, families, and local community members, as appropriate to their needs and wishes. By helping people stay or get connected, they are better prepared to return home and ultimately reduce re-incarceration rates. The U.S. jail system is grounded in the belief that to facilitate public safety, society must isolate people convicted of crimes from their communities, families, and social supports. The project will be led by Laura Rodgers, LCSW, Chief Program Officer at JFS and include support from the Atlantic County Department of Public Safety and Dr. Christine Tartaro, Professor of Criminal Justice at Stockton University. Key Collaborators from the UK include Professor Martin Webber, Director of the International Centre for Mental Health Social Research and Deputy Head of the Department of Social Policy and Social Work at the University of York, England, and Nicola Moran, PhD. Both Webber and Moran are members of the research team responsible for the development of Connecting People and its adaptation internationally. Recently, Professor Webber and Dr. Moran visited JFS to immerse themselves in the agency’s work. They met with JFS staff members and spent time in the field in order to better adapt the model to suit the needs of local consumers. Led by Sabai Soap Company’s Marna Cutler, participants learned the art of soap making during Village by the Shore’s event on February 15 at the JCC. Previous events included a Mosaics Party and Wine Tasting, funded by a Jewish Federation micro-grant. “We are excited about the opportunity to adapt this evidence-based model locally. With the experts and entities we have on board to support this program, we are confident we will make a difference for our consumers in Atlantic County,” said Rodgers. State of the Agency Volunteer Workforce At JFS, we often say that volunteers are the backbone of the agency. On any given day you will see people organizing Kosher meals for delivery, putting together a mailing, stocking the pantry shelves and the list goes on. This is no surprise given JFS was established more than 100 years ago by volunteers as a vehicle to help others in need. Volunteers show up each week because of their commitment Andrea Steinberg, CEO to who we are and the people we serve at JFS. We could not carry out our mission to motivate and empower people without their commitment to helping others. We currently have more than 130 volunteers who donate 1,000 hours per year. They do everything from help plan and execute critical fundraising events to assist Village members daily. As the agency continues to grow its programs and services, so too do our professional needs grow. In the coming months, we will be enhancing our volunteer efforts. Through a competitive bidding process, JFS was chosen to be a site for AmeriCorps Volunteers in Service to America (VISTA) project. VISTA members serve as a catalyst for change, living and working alongside community members to meet our nationâ&#x20AC;&#x2122;s most pressing challenges and advance local solutions. VISTA members bring passion and perseverance where the need is greatest to help eradicate poverty. At JFS, we are looking for two motivated, committed volunteers to work to operate the agency food pantry as well as other essential community initiatives. Under the leadership of the Volunteer Services Supervisor, VISTA members will move work forward. The team looks to build on the strong and committed group of volunteers to enhance the good work that has always been integral to JFS operations. Volunteer involvement is ideal for the growing number of retiring baby boomers and energetic young people who are looking for opportunities to either gain experience or use their life experience to give back. Work is underway to take a more talent management approach to recruit, develop, place, recognize and retain volunteer talent matching their professional skills to essential duties of the agency. While the traditional roles of volunteers will continue, we will also begin to expand on these roles to meet the ever growing needs in the community. By focusing on the professional talents of volunteers, we know their experiences will be even more meaningful, further develop their skills, demonstrate impact, and speak to their interests. In some cases, for example, this approach to recruit and manage volunteer talent could allow retired baby boomers who perhaps served in leadership roles to mentor young agency professionals leading to improved staff morale and lower turnover. Also, many times our local volunteers possess intimate knowledge of our community's assets, challenges and the important players making them integral in helping us stay connected, planning events and helping to promote the agency's mission. What makes JFS unique in today's culture is that volunteers have always been involved in the agency's mission critical work and have been so crucial to our success. I am excited to see what the next level volunteer workforce brings to the community. Housing First Program Reports Positive Results for Chronically Homeless JFS' Housing First program has exceeded initial expectations for tackling chronic homelessness across the county. In 2016, the agency was awarded vouchers from the New Jersey Department of Community Affairs to assist chronically homeless individuals find and maintain housing. The Department of Housing and Development defines chronic homelessness as an individual with a disability who has been homeless for one year or on at least four separate occasions in the last three years or an individual residing in an institutional care facility, including a jail, hospital, substance abuse or mental health treatment facility. Working with AtlantiCare and the Atlantic County Justice Facility, JFS identified 45 high risk individuals, eight of whom were veterans. These individuals were high system utilizers of the hospital emergency department, jail, or both. As of this year, none of the participants have returned to homelessness and all have seen a dramatic decrease in healthcare and criminal justice system usage, including one individual who went from 55 emergency room visits to only two. Chronically homeless individuals are among the most vulnerable homeless groups. To help alleviate the problem, JFS has identified best practices that require affordable housing paired with flexible support services. JFS staff worked with Housing First participants to coordinate primary medical care, substance abuse and/or mental health counseling, assistance in securing benefits such as Medicaid and Food Stamps, help in obtaining and maintaining employment, and guidance when securing housing, security deposits, furniture, household items and transportation. The project team, overseen by Christina Bailey, LCSW, Director of Atlantic Homeless Alliance and Justice Involved Services, consists of a Housing Locator, Case Managers/Supportive Housing Staff and an On-Call Team. Robert Wood Johnson Foundation (Cont. from pg. 1) Studies find those with mental illness face isolation due to the strain the disease puts on relationships and the stigma associated with the illness. For individuals who are incarcerated, social isolation comes from physical separation, a lack of positive social interactions, damaged trust, and the stigma of having a criminal record. JFS recognizes the relationship between these two groups, as people experiencing mental illness and trauma are significantly over-represented in jails. Approximately 14.5 percent of men and 31 percent of women in jails have a serious mental illness such as schizophrenia, major depression, or bipolar disorder, compared to 3-5 percent outside of incarceration. RWJF has been a catalyst for fundamental changes in health care by funding initiatives which enable people to live healthier lives. In keeping with the Foundationâ&#x20AC;&#x2122;s mission, Connecting People presents an opportunity to advance a culture of health in the U.S. Social isolation poses a significant and increasing health risk. Incarcerated individuals experience chronic health conditions, infectious diseases, substance abuse and mental illness at much higher rates than the general population. By directly addressing the mental health of returning citizens, and potentially reducing recidivism, this project could contribute to stronger health outcomes among those formerly incarcerated. With the ultimate goal of measurably better outcomes for all, JFS will be at the forefront for adapting the program for other marginalized populations, including individuals with learning disabilities and those experiencing homelessness, as well as at other agencies across the country. For more information about this initiative, please contact Laura Rodgers at 609-822-1108 x133 or lrodgers@jfsatlantic.org. Life & Legacy: Strengthening the Future of Jewish Organizations Life & Legacy is a four-year partnership program conducted by the Harold Grinspoon Foundation which motivates Jewish organizations to integrate legacy giving into the philanthropic culture of the Jewish community. During the first year of the program, our Jewish community received more than 180 Declarations of Intent with an estimated $7 million of future funding. To ensure the agency will only be greater down the road, JFS received 26 commitments from our generous supporters in year one. Thanks to the thoughtfulness of Life & Legacy supporters, there will always be an open door, a kind soul and sympathetic ear when community members are in need. If you would like more information about leaving a legacy to positively impact future generations, please contact Beth Joseph at 609.822.7409 or bjoseph@jfsatlantic.org. Mission in the Community Whether you serve as a board member, committee member, volunteer, staff, or are a consumer receiving support, you have the power to impact our mission in the community. Even a simple action like creating or sharing a social media post can have a profound impact. When JFS Board Vice President Johanna Perskie shared why she gives Darren Matik, President to JFS on Facebook this past Giving Tuesday, she raised $1,200 for the agency within 48 hours. Last year, Todd Arsenault as a new JFS & JCC Golf Tournament committee member brought in thousands of dollars in sponsorships not to mention dozens of in-kind donations and golfers. This year, as co-chair of the event, he is working hard to raise our fundraising target to a new level of $65,000 which will benefit essential agency services. Examples of your impact are everywhere. Each Thursday, Zelda Soloff is in the JFS kitchen bright and early packing meals to deliver to homebound residents. Even with two jobs and her own family obligations, she makes time to help others who rely on our support. JFS is always evolving and building to increase our effectiveness in the community. The wonderful and important work of staff allows JFS to carry its exemplary reputation as a premier agency in South Jersey. Earlier this year, a consumer named John moved into permanent housing for the first time in more than a decade. He works with a JFS Case Manager almost daily to empower himself for positive change as he assimilates into his new situation. Through his experience with JFS, John has recognized the importance of giving back and volunteers in the food pantry. Whatever has brought you to JFS, your efforts are paying off for those in need in our community. Please make sure you take a moment to thank the people who are helping advance our mission. A simple thank you goes a long way. And share these stories, especially with those who might not know what JFS does. Never underestimate your power to influence even by what seems like a small gesture. You continue to be a voice for those who turn to JFS. Cila Behr Retires after 25 years Cila Behr, JFS Front Desk Administrative Associate, retired in December after 25 years of service. Behr began her career as a receptionist and saw the agency grow from approximately 30 employees to a staff of 180. As JFS grew, so did Behr’s role. Often the first person people saw when they walked through the doors, Behr was able to direct clients to the appropriate programs and services they needed. For her years of exemplary service, Behr was twice nominated for the JFS annual “Heart and Soul” award, and though she may no longer be employed with JFS, Behr will continue to share her time and talents with the agency, volunteering for the annual House Tour in August. JFS Links to Health Keeping Clients Connected to Care Recent studies show adults with serious mental illness have a decreased life expectancy of up to 25 years compared to the general population. Behavioral Health Home models, like JFS Links to Health, work to provide care coordination, linkages and coaching to help individuals stay engaged and connected to their health ultimately improving outcomes and reducing hospitalizations. Through the experienced and qualified Links to Health staff, individuals receive many benefits including help with scheduling primary care provider appointments, medical screenings and wellness workshops. JFS Links to Health is certified by the Division of Mental Health & Addiction Services in the State of New Jersey. With vast experience in a variety of mental health services, many healthcare providers refer patients to JFS for expert care. To date, there are more than 70 clients in the Links to Health program and growing. Individuals 18 and older Resident of Atlantic or Cape May Counties Have a chronic medical condition or are at risk of a chronic medical condition Diagnosis of any form of schizophrenia, schizo affective disorder, and/or bipolar disorder Current recipient of or eligible to receive New Jersey Medicaid. 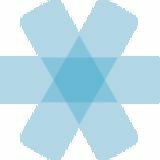 Why is this program important? Studies show that individuals diagnosed with a mental illness are often unable to follow through with the necessary treatment. This can lead to additional medical conditions, lack of critical treatment and even shorter life expectancy. For more information about Links to Health services please contact Jim McGuigan at 609.822.1108 x149 or jmcguigan@jfsatlantic.org. On the Move Program Helps Clients Spring Into Action On the Move builds on the agency’s extensive list of health and wellness offerings. The goal of the new initiative is to promote overall health and prevent and control obesity, chronic disease, related risk factors and other illnesses for existing JFS clients. The behavior-based program, led by Ann Thoresen, LCSW, Senior Director at JFS, consists of a free, 12week series of workshops designed to help those experiencing barriers to healthy living. In particular, the On the Move program benefits individuals with mental illness, differing physical abilities and those experiencing homelessness or recently housed. Members of the Access Center team are pictured here (left to right): Jennifer Snyder, Front Desk Associate; Rita King, LCSW, Supervisor; Maria Diaz, Front Desk Associate; Naomi Jones, Ph.D., Senior Director of Outpatient Services; Crystal Snow, Intake Associate; and Paola Ortiz-Morillo, Intake Associate. To learn more about JFS programs, services and events, please visit jfsatlantic.org. Village to Village Network Helping Adults Age in Place Did you know that JFS Village by the Shore (VBTS) is part of a larger network? The Village to Village Network is a national organization of community-based Villages throughout the United States dedicated to changing the paradigm of aging in America. The Village Movement has successfully established a model that enables older adults to age in place inside their homes while remaining active and connected within their communities. Villages improve quality of life, provide alternatives in transportation and support services, and tackle isolation among the aging populations. JFS VBTS is one of more than 250 villages operating across the United States and 150 more are in development. Today, more than 60,000 people are a part of the Village Movement. One of those is JFS Village by the Shore member Barbara Sullivan, who is also the Director of the national Village to Village Network. Barbara recently moved to Atlantic County and has already participated in a variety of Village by the Shore social programs. She brings with her a wealth of knowledge and experience that we will all benefit from. Villages are founded on the concept of neighbors helping neighbors. VBTS embraces this idea with a variety of member services such as complimentary trash valet, meal delivery, social activities, discounts from select service providers, and more. These offerings continue to improve quality of life and expand choices for boomers. Village members also experience increased independence which helps tackle the harmful effects caused by loneliness. When people participate in their local village, either as a member, volunteer, or service partner, they join a movement committed to making a positive impact on the lives of others. The Village movement is an important part of the new revolution in aging! This is an excerpt of the Village by the Shore Fall/Winter 2018 newsletter. To receive the newsletter in its entirety, contact 609-822-1109 or villagejfs@jfsatlantic.org. Life is a series of ages and stages; the only constant being change. Artful aging is about how we em-brace the cycle of change at every age and stage of life. So how are the boomers handling the 65 and beyond years? Boomers are the largest generation to become elders. They are also the first generation to have a much longer time between their “older” and “oldest” years. Many can now reasonably contemplate living into their 90’s and even 100’s. With increasing life spans, boomers needed to re-frame their older years as a time of new opportunities and growth. Many boomers are asking themselves, “What do I want to do with the rest of my life? At the same time, communities around the country needed a cost effective way of assisting seniors with aging in place while remaining vital parts of their neighborhood. As boomers were seeking communit y, new relationships, and socialization, fresh ideas took hold and produced the Village concept. More than 250 community villages have answered the call. Villages allow members to maintain their feelings of independence by having a say in the types of services provided and when and how they are provided. This gives a sense of autonomy and control over their own lives. Through the concept of neighbor helping neighbor, JFS Village by the Shore (VBTS) replaces dependence with interdependence. For an introductory price of $180 annually or $18 a month for 12 months, members have access to door to door transportation, trash valet, tech support, meal delivery, in home grocery shopping, weekly phone check-ins & friendly visits, care coordination and access to a vetted partner network of local businesses, restaurants & agencies. VBTS also provides many social and educational programs and events like Coffee Klatch (current events beyond the headlines), Lunch Around Town, Village Socials with live dance bands, flower arranging, painting and gardening classes, creative writing, soap making, memory cafes, tai chi and so much more! Aging should not make one a “burden” but rather role models for future generations of living every day to its fullest in the best possible way. Members can also become volunteers. Socialization (the number one factor that supports healthy aging) and providing purpose are built into volunteering. While helping others volunteers are actually helping themselves. Village volunteers facilitate classes, help with many of the member services listed above, support JFS fund raisers, work in the food pantry & diaper pantry, and are often the eyes and ears for Village staff. JFS Retired Senior Volunteer Corp (RSVP) volunteers also are dispersed around the larger community to places like Gilda’s Club and Reading Buddies, and are soon to be working with the local homeless population. This helps adults remain connected through involvement with social activism and organizational work while sharing their knowledge and care with the community. VBTS also vets neighborhood businesses and agencies that offer a variety of reliable, trustworthy and quality services to Village members not provided by Village staff and volunteers. Elder legal services, HVAC services, contractors, pet care, pharmacy, home-care, senior design, and hospice are just a few of the services offered. These “Service Partners” often offer discounts to Village members. As boomers contemplate their future, they look within to determine how best to incorporate their values and meaning into their everyday lives. As they accept and grow with life’s physical, mental and emotional changes, they are embracing new relationships, second careers and volunteerism, while pursuing hobbies, social activism and travel, all with a balance of lessons learned and hope for the future. If you’d like to get more involved with the community through JFS Village, please call Tina Serota at 609-822-1109. Pictured left to right are Beth Joseph, JFS Senior Director of Communications and Donor Relations; Laura Rodgers, LCSW, JFS Chief Program Officer; Andrea Steinberg, JFS CEO; Robert Doherty, Bank of America NJ Market President; and Christine Zoda-Egizi, JFS Associate Director of Community Support Services. JFS recently was awarded Bank of America’s Neighborhood Builders Award for providing critical services to the community. Bank of America created the Neighborhood Builders program in 2004 to support the work of non-profit organizations which serve as the backbone of many communities. Through this program, grants are awarded to provide tools, training and funding to help selected nonprofit organizations create more sustainable communities. “While the daily need for support is constant, it is critical that we understand and focus on the long term effect of our work,” said Andrea Steinberg, JFS CEO. “Not only does this program advance nonprofit work but strengthens leaders and supports organizational leadership development.” As a Bank of America Neighborhood Builders awardee, JFS will receive $200,000 in flexible funding over the next two years for leadership development for an executive director and an emerging leader at the organization, and the opportunity to connect to a network of peer organizations and access capital. Neighborhood Builders is one of the nation’s largest philanthropic investments in nonprofit leadership development, strengthening the network of nonprofit leadership that is critical to helping our local communities thrive. JFS named Christine Zoda-Egizi, Associate Director of Community Support Services, as its emerging leader as part of the Bank of America Neighborhood Builders Grant. She, along with CEO, Andrea Steinberg will participate in a series of training sessions and workshops as part of this multi-year initiative. MLR Friends & Family Bike Ride Makes Last Trek More than a dozen people participated in the 11th Annual Marc L. Rosenberg (MLR) Friends & Family Bike Ride on September 22, 2018. The final bike ride was a memorable one, according to event organizer Patti Rosenberg. “Our later date proved to be the perfect day for a bike ride at the Shore. A big thank you to those who came along on the ride as well as to those who could not make it but still supported our effort.” Patti also announced this will be the last year for the bike ride. Since its inception in 2008, she coordinated 11 rides raising more than $25,000 to support the Marc L. Rosenberg Memorial Fund at JFS in memory of her husband. Food Pantry Receives Support from The Wawa Foundation JFS received $7,500 from The Wawa Foundation in October 2018 to support the agency’s Food Pantry and nutritional services programs. The Wawa Foundation supports positive change and awareness for its community partners with a focus on Health, Hunger and Everyday Heroes. In addition to a financial contribution, Wawa continues to support JFS through food and beverage donations. TD Bank Awards $5,000 to Support Vocational Services JFS received a $5,000 grant from the TD Charitable Foundation to fund the agency’s vocational services, which supports individuals dealing with a disability to find employment. The funds allow JFS to provide job search and internship support, soft skills development, and job retention support. Grant from Fox & Roach to Fund Food Pantry Fox & Roach Trident Charities awarded JFS $4,000 to fund the Food Pantry, ensuring children, individuals and families have access to essential food. Serving over 2,500 individuals and families per year, the Food Pantry continues to be an important resource for senior citizens on fixed incomes, families with low incomes, and those experiencing a temporary crisis. JFNA Funds Groundbreaking Holocaust Survivor Care JFS is proud to receive a grant from The Jewish Federations of North America’s Center for Advancing Holocaust Survivor Care. This award will enable JFS to provide enhanced programming for survivors, as well as provide the agency with intensive training on Person-Centered, Trauma-Informed (PCTI) care. Monica Lewinsky to Headline 26th Annual Women’s Forum Guests were treated to an evening of culinary delights as they gathered at Steve & Cookie’s on November 6th to support the agency’s health and wellness initiatives. The annual event brings awareness to the lack of nutritional options for those in the community, particularly for those experiencing mental illness. Sixty guests enjoyed a three-course vegetarian and glutenfree meal made with seasonal herbs, vegetables and farm-raised eggs. Herbalist Gayle Gross, accompanied by nutritionist Diane Melano and chicken rancher Gail Reichman, shared the nutritional benefits of each dish, which included Korean pancakes with oyster and shiitake mushrooms; beetroot, cauliflower and turnip soup, roasted butternut squash and sautéed kale and sweet potato hummus. The next Herb Dinner will take place October 29, 2019. Special thanks to Cookie Till and her amazing staff for planning and preparing a delicious and unique meal once again. 32nd Annual JFS House Tour is August 5 This year’s event, scheduled for August 5, hopes to raise $65,000 to support JFS Village by the Shore. Unlike any fundraiser in South Jersey, the JFS House Tour offers guests a unique opportunity to explore the most luxurious seashore homes throughout Ventnor, Margate and Longport. During the month of December, Linwood Country Club members and staff collected non-perishable food items for the JFS Food Pantry. The JFS Food Pantry offers hearty meal options to individuals and families who are experiencing economic hardships, homebound seniors on fixed incomes, adults with disabilities, young families with low incomes, and others facing temporary crises. Brothers, Sam and Luke Goldstein, spent time at JFS sorting coats for Project Homeless Connect. Volunteers like the Goldsteins are the backbone of Jewish Family Service and inspire others with their generosity, kindness and desire to help others. Village members and guests gathered at the Katz JCC in December for a painting workshop. Participants were provided with canvases and materials to paint a scenic scene featuring a cardinal in the snow. Friends Scott needed steady employment to remain independent. Scott was referred to the JFS Vocational program because he wanted to work, but at 54 years-old he had no job experience due to disability and mental illness. PAWS Pet Care, a JFS dog walking service, which provides job training, coaching, and employment to people with disabilities helped Scott learn customer service, dog walking, basic first aid, and how to use a smartphone. When Scott received his first paycheck, he could hardly contain his excitement. “I never thought I would have the worth enough to actually get a paycheck!” One year later, Scott has steady employment at a local apparel store and is living in his own apartment. A complete list of givers is at jfsatlantic.org under Ways to Give. Honorary Board of Directors* Gail Mackler-Carlino Kenneth Eisenberg Alice Epsteinº Anna Feldman Bethanie Gorny, Ed.D Larry Horowitz, CPA Shy Kramer Robert Lang, Esq. Marc Lowenstein, Ph.D. Arlene Potler Patti Reed-Rosenberg Carol G. Rimm Lois Rothenbergº Douglas Stanger, Esq. Kenneth Steinberg Eric Wood, Esq. Golda Wood Community Advisory Board Joanne Gahr, M.S., CRC Barry Goff, Jr. Jennifer K. Goudy Teresa Katz Samantha Kiley Alexander C. Marino Alexandra Nunzi Sean Riggin James A. Sarkos John Zarych, Esq. In 2018, Fox Rehabilitation made a financial commitment to Jewish Family Service as a Leader Agency Donor, pledging $10,000 over the next 2 years, to ensure continued access to essential programs and services to those in the community. Fox Rehabilitation has made it their mission to rehabilitate lives by empowering their staff to provide exceptional care to older adults and helping them to achieve what they once thought impossible – optimal function to live full, meaningful lives. A leader in physical therapy, exercise physiology, occupational therapy, and speechlanguage pathology, Fox Rehabilitation has practices in 17 states, and continues to grow. As a Village by the Shore service partner, Fox Rehabilitation has proven themselves a trusted resource for members and seniors across Atlantic County. Their support also extends to House Tour, Cocktail Party, and the JFS & JCC Golf Tournament. BUILDER AtlantiCare Fitzpatrick, Bongiovanni & Kelly, CPA Fox Rothschild, LLP Galloway Auto & Tire Center Mitchell Gurwicz Newman’s Own Foundation Roth-Goldsteins’ Memorial Chapel Wells Fargo Antoinette & Eric Wood Anna & Marc Feldman Bonnie & Ed Gurwicz Court Furniture Claudia & Eric Goldberg TD Charitable Foundation Herbert & Lois Rothenberg Charitable Foundation To become an agency donor or learn more, contact Beth Joseph, Senior Director of Communications & Donor Relations @ 609.822.7409. 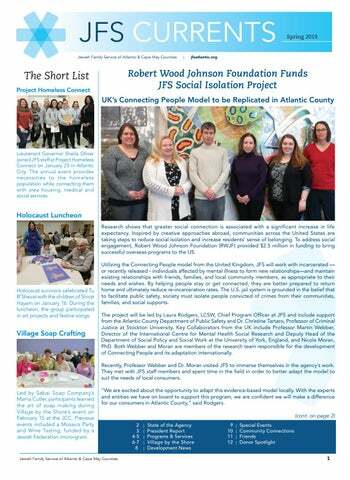 Explore the latest edition of JFS Currents, the bi-annual newsletter of Jewish Family Service of Atlantic and Cape May Counties.